Google Now was first introduced back in Jelly Bean 4.1 and is definitely one of the most interesting additions to the OS. Simply put, it's Google's version of a personal assistant. Google Now is in the same neck of the woods as Apple's Siri, but it learns over time from your daily routines. It's accessed by swiping up from the three navigation buttons at the bottom and gives you a short overview of information it believes is relevant to you right now. Going to work in the morning? Google Now knows this and lets you know there's a big traffic jam on your usual way to the office, so it offers you a re-route. In Jelly Bean 4.2, Google Now has become even smarter and, if you allow it, can scan your email for upcoming flights, deliveries or restaurant reservations and let you know when they are due. There are also numerous kinds of cards like birthdays (yours and contacts') and what distance you've walked in a particular month. The last one could definitely feel creepy for some users, but it's easily turned off from the Google Now settings menu. The Google Nexus 10 is the first tablet to use a pair of Cortex-A15 CPU cores and only the second mobile device, after the new Samsung Chromebook. The chipset that powers both devices is the Exynos 5250 - it packs tow A15 cores at 1.7GHz, 2GB of RAM and a Mali-604 GPU. With a next-gen CPU and GPU architectures (not to mention the latest Android), we expected the Nexus 10 to be a benchmark champion, but while it did score pretty well, it didn't really dominate. Perhaps it's the fact that two cores even of a new architecture can't quite four A9/Kraits, or it could be an issue that the benchmarks themselves have with the relatively young Android 4.2 Jelly Bean, but the Nexus 10 didn't do much better than the Nexus 4 we tested last week here. Benchmark Pi is a single-threaded benchmark, so core count doesn't matter. The HTC One X+ with its Cortex-A9 cores clocked at 1.7GHz managed to post the best time here, while the Nexus 10 ended up trailing even phones with lower clockspeeds (though it did beat its Nexus 4 sibling). Moving to the multi-threaded Linpack test, the Nexus 10 still had trouble beating the competition that uses the older Cortex-A9 and Krait CPUs. It did worse than the quad-core Krait CPU in the Nexus 4 too. We've removed the 600+ score of the LG Optimus G as we believe it was caused by a bug. Then there's AnTuTu, which tests the whole system (RAM, storage, etc.) 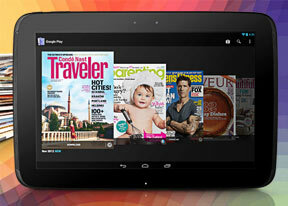 and the Nexus 10 tablet again come in the middle of the pack. It came at the bottom in the Quadrant ranking. We tested the new GPU with GLBenchmark 2.5 - both on and off-screen. The difference between the two modes is that off-screen tests at a fixed 1080p resolution. While the powerful GPU in the iPad 4 remains out of reach, the Nexus 10 hits a playable 35fps framerate at this resolution. When we move to on-screen mode (that renders graphics at the screen resolution), the framerate drops significantly. There were moments when the framerate was limited by VSync (60fps software limit), but most of the time it was lower. The average framerate was a choppy 23fps. Keep in mind that the Nexus 10 screen has a higher resolution than even the iPad 4. Browser benchmark scores usually improve with every new version of Android. Both the Nexus 10 and the Nexus 4 are running Android 4.2 with Chrome as the default browser and they both failed to impress, and traded blows in SunSpider and BrowserMark 2. The Vellamo score was good, but again not the best.